Permaculture seeks to impose thoughtful changes on both us and the land. Often these changes can require continual upkeep and burden us with chores. Perhaps that’s the lure of modern life, trading many little chores for a job and shopping. Creating systems that work on their own or very easily cuts down on the to do list. However, it requires much observation and tweaking to get the system right. Perhaps it is a question ultimately of how do we want to spend our time? And also how much do we work on now, how much do we work on the future? It’s almost a stance or intention. The more more accurate the design, the more it works on it’s own. If an intention is part of the system then we can design for it, make a choice about how we face the world. Set the intention and the rest can follow. What sort of stance are you taking in your life? How much are you working for the now and how much for the future? Simple in it’s form, complex in it’s function. 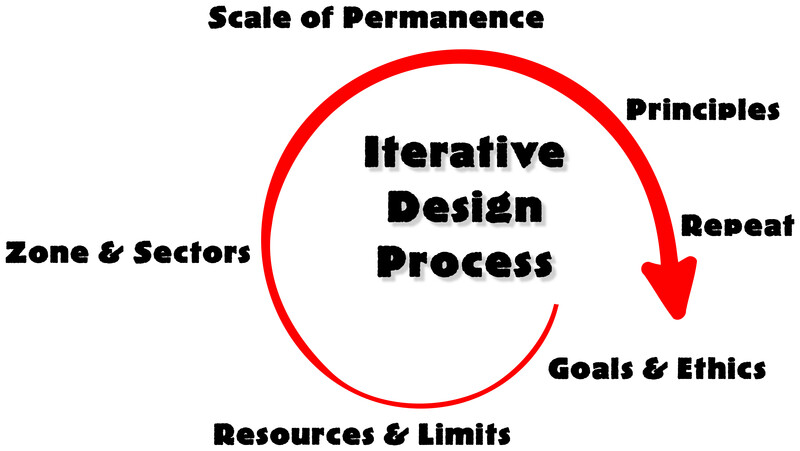 The iterative design process (IDP) works recursively and is best used fractally. Fundamentally it is observation of all interacting parties to find leverage points that move us in the direction of goals, the greater the depth of the observation the more accurate the design. What should the outcome be? What specific things need to happen? Use the ethics to create and check your goals. Write it down. Your resources and limiting factors are your strengths and weaknesses, your in and out breath. Better make a list. 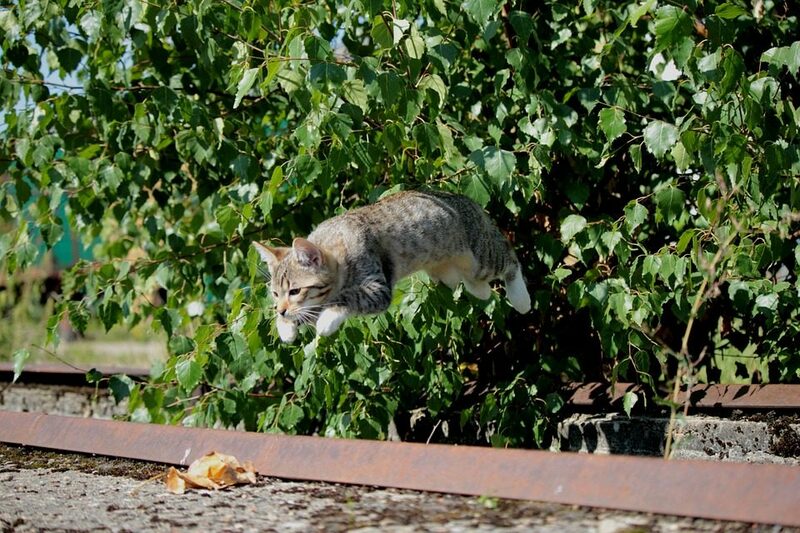 Know how much energy you’re committing and the relative amount of effort and effect. Pick a place to start. Organize elements by their relative placement and identify incoming or outgoing energy flows. How does your element relate to the whole? 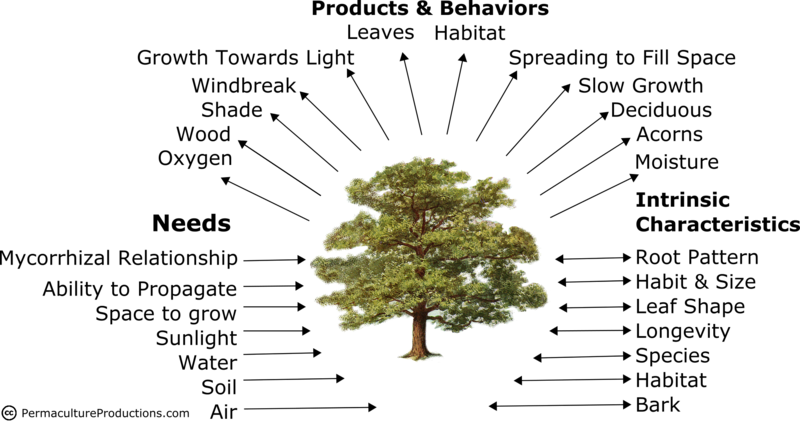 Use the principles to reveal ways that the resources or limiting factors might be approached. I realize I have left out Action from the process. Take what you have learned through this process and put it into action. The larger and complex your change the more time and effort it will take to stabilize. This may seem too facile but elementary things build up to make the most complex of systems. This process gets the momentum going. Rhonda Baird, William Faith, and I used a form of the IDP to start a project that would get us, three regionally adjacent permaculture teachers, together teaching a PDC. We’ve ended up forming the GLPDC and running an experiential design course for 6 weekends that has all the lecture frontloaded with short presentations on youtube and some accompanied reading. A clear and obtainable goal lead to continued forward momentum. Since the goal is guided by the ethics, it has the complexity to cause multiple beneficial effects. We ultimately want to build up the numbers of people who will have the skills, knowledge, and passion to implement high quality designs within our bioregion. Considering our goals within the context of our resources and limits lead us to use the nature of our lack of proximity as an advantage. We used skype and our recording knowledge to create short lectures, leaving class time as an active experience to increase the student’s momentum. We’ve constructed the course by combining the PINA curriculum with tools from the book “Liberating Structures“, Group Works , and other hands on activities. The experience we have between us gives us the ability to improvise as needed within the framework of our curriculum to give the students the best experience possible. We know that investing in each of our local bioregions is a long term proposition that can dramatically transform them on a larger time scale. It’s a long hard slog but the result would be worth the effort. Since the three teachers are up to a day’s drive apart we’re each working in the others zone 5 (the far edge of their influence) but by planning to move each full design course between the three locations we build up a local population of permaculturists, essentially pumping up our combined region with local systems thinkers. Leveraging our limited proximity to record lectures is a long term process (small and slow solutions), but provides a new format for our current course (obtain a yield & creatively use & respond to change), and makes them available both for future use (catch and store energy). We have come together as the GLPDC to put on permaculture courses in each of our locals, benefiting from the strength of our diversity being brought to each of our locations. As we have proceeded the formalness of the design has softened into something more organic. We continue to progress but new patterns have emerged to continue the momentum rather than get it started. So I’ve been working with the GLPDC to create lectures for our ongoing PDC. 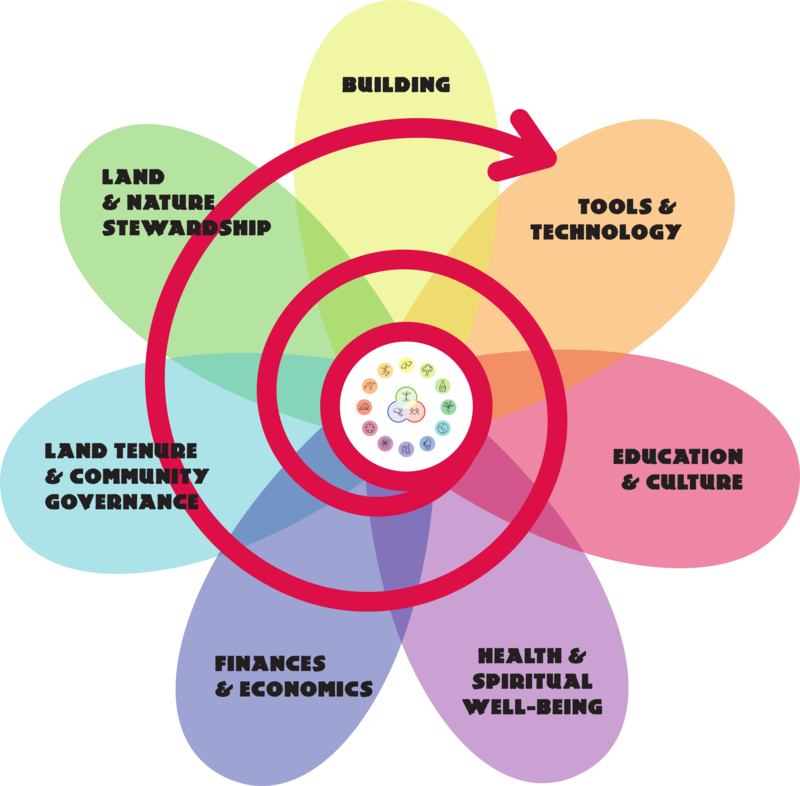 We’ve adopted using the permaculture flower, by David Holmgren, as a landmark for each topic but I’m thinking it works differently than we initially understood. Before we thought that a topic, say water, would manifest certain petals of the flower. Now I think it’s the opposite. The whole flower manifests through every topic; it’s why instead of what. What’s more the flower can be divided into two distinct groups. Things that manifest in the physical world, like buildings, trees, swales, etc. and those that are invisible structures: education, community governance, finance. Notice that I’ve rotated the flower so that the top three petals represent the physical and the the bottom four are “invisible” as if they are roots below. How we take care of the physical water we have. Dams, ponds, piping, water treatment plants. How we treat, move, and clean water. Regulations and requirements, how we use, or even how we think about water. Who owns it. The business and cost of water. Our health in relationship to the water around us or the spirit or life of the water (see Spirited Away for one manifestation of this). How we act and communicate the importance, care for, and cleaning of water. The flower gives us an organization and structure for different aspects of how water can be used and thought of. The same holds true for any other topic in permaculture. We can orient ourselves to the different petals of the flower on a topic, thereby seeing (and then being able to make use of) the patterns of. …If you need pictures in the future use the search tools in google image search. We could talk about the licensing or you could read up on creative commons if you need to. For optimum permaculture I’m recommending that your site be creative commons (this license), well labeled, and tagged so that google picks it up (a la a plugin to install in wordpress). Here’s mine as an example. The web works best when it’s creative commons; the mashup of culture can work at full speed. I know it’s hard to shift paradigms, to change. When we understand how things work and use them with their best relationship, we can do more; our leverage is multiplied. I trust free culture and believe it meets the ethics, conversely I distrust the regime of control that copyright represents as it fails the test of the ethics. I think permaculture is best when it is creative commons. Anyone who is seeking to make change in the world would do well to take a look at Donella Meadows’ list of leverage points, 12 places to intervene in a system. For us the real power lies in the ability to look beyond the direct effects of a decision to what would in essence be the effects of the effects. The increasing leverage we can gain from our decisions comes about because of tuning in to and actively designing with these radiating effects in mind. Numbers 1-6 of the Places to Intervene in a System are about changing the path you are on (inflection points), while number 7-12 are about how you are going to take the path you are currently on (smaller points of leverage along the same path). We’ll write more about this next time, for now take a look at the leverage points, read the article, and get a feel for what sort of decision each is and on what scale it is compared to the others. 12 – Constants, parameters, numbers (such as subsidies, taxes, standards). 11 – The sizes of buffers and other stabilizing stocks, relative to their flows. 10 – The structure of material stocks and flows (such as transport networks, population age structures). 9 – The lengths of delays, relative to the rate of system change. 8 – The strength of negative feedback loops, relative to the impacts they are trying to correct against. 7 – The gain around driving positive feedback loops. 6 – The structure of information flows (who does and does not have access to information). 5 – The rules of the system (such as incentives, punishments, constraints). 4 – The power to add, change, evolve, or self-organize system structure. 3 – The goals of the system. 2 – The mindset or paradigm out of which the system — its goals, structure, rules, delays, parameters — arises. 1 – The power to transcend paradigms. There are several versions available, http://www.thesolutionsjournal.com/node/419 is more complete than some. For further reading on leverage points check out http://www.thwink.org/sustain/glossary/LeveragePoint.htm. As I’ve been slowly working out a morning routine I think it’s worth sharing what I am currently doing. After working on 5bx (5 basic exercises) for a while, I’ve upgraded to some yoga stretching. It’s greatly superior to the 5bx but the 5bx had a very comfortable intensity curve (perhaps too comfortable as I had to skip up occasionally) that has enabled me to directly step in to a yoga routine. Add some turkish getups (5 minustes alternating sides) and I think I’ve got a pretty good morning routine going. Energy (earth) & Awareness (people). Energy is external, physical world, awareness is internal. Energy is required to interface between systems; the energy cost of interaction increases the further apart systems are from each other in terms of storing energy and/or awareness. Permaculture is a tool that increases our awareness so that we can capture and/or store more energy and cycle it through the system in a greater number more and efficient ways. We have available a fixed energy budget based on the sunlight that hits the earth. There is also a limited supply of energy stored by live on earth. Our ever growing awareness is the only thing that can increase. In our past blog posts we have explored holons, quadrants, and states. The next aspect of integral theory we’d like to examine with a permaculture eye is the concept of types. What are types in integral theory? Paraphrased from Integrallife.com in an overview of integral theory, types are the variety of consistent styles that arise in the different aspects of our lives. They are stable and resilient patterns that can overlap and may even be incongruous. For example, Myers-Briggs personality types, masculine and feminine genders, and even astrological signs are different typologies that we can use to attempt to understand people. A simplified way to think about types can be seen in human language. We organize our very existence by giving names to objects and concepts, allowing us to access and communicate layers of information by understanding a simple pattern – nouns, adjectives and verbs. Words are therefore types: the connection between the abstract and concrete, internal and external realms. However, types are not so much the definition of something as they are a framework for how we organize and communicate about the world by identifying patterns and shared characteristics. And in language, it is how we stitch the types together in functional relationships that creates meaning. Each element in any permaculture design is essentially a type. Permaculture uses a mapping technique known as needs, products, behaviors and intrinsic characteristics to help flesh out what we know about the elements (types) in our designs. This exercise helps us discover the edges of our elements, revealing the potential relationships between them. Once we know this information, we can connect our elements to each other in a functional network. In other words, these relationships define the functions that a type can provide to the design. For example, a group of trees which primarily function as a windbreak can also produce firewood, create microclimate and serve as wildlife habitat. These functions all are dependant on the connections to other elements in the design: a windbreak needs another element to protect, firewood needs someone to burn it, etc. In permaculture we want each element to serve multiple functions and have multiple connections to other elements. The more connections between the needs, products, behaviors, and characteristics of elements, the stronger and more resilient the design. Once we’ve made an initial connection, we need to continue to observe the elements to ensure the relationship is functioning through time. While the details will be different from situation to situation, types give us a rough framework of patterns from which to stitch our design together. Ultimately, the possibilities of types that we could work with are not as important as how they connect and relate with one another. People are the most complex element in the whole design. By definition, permaculture is designing for people. Culturally, we have a habit of not considering people enough in the first place in all the things we do, let alone integrating them into any sort of permaculture design. We need to make an attempt to take into account all aspects the design, starting with creating an awareness of for whom and within what social contexts the design is occurring, and of the broad patterns that people create within and surrounding the design. 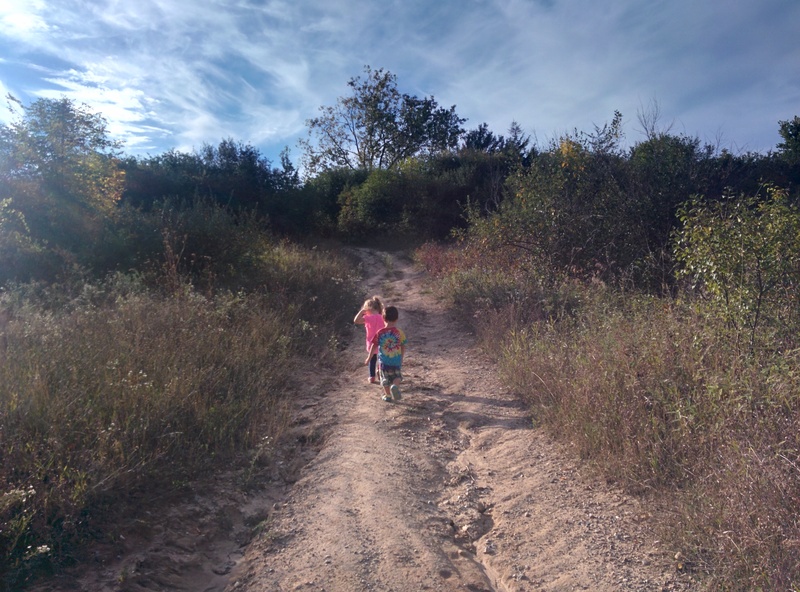 People are not as simple as a chicken or a windbreak, but have layers to their lives owing to the different life experience, roles and responsibilities they take on. In other words, just as in the definition from integrallife.com, people are a combination of many overlapping types, and the types can even be conflicting or contradictory. This greatly increases the complexity of the design. Adding to the complexity, all of these types will change through time: a design for a bachelor would be completely different than one for a family, and in time, the bachelor could eventually have a family. Through time the design has to have the flexibility to change as both the landscape and the lives of the participants in the design change. Knowing what types of people are present, what types of lives they lead and what type of community surrounds them does give us some guidance as we create a design. But we need to keep in mind that with all the potential complexity that people bring to the table, actually creating a working, static design is very improbable. Instead, we need to create feedback loops that allow us to emergently understand and be more sensitive to the needs of a particular person, group of people, or place. Permaculture tells us to carefully observe all the elements of our design, which includes the people involved. We must open our eyes to all the myriad things that that support us as humans, as well as see and change the things that don’t. We can increase our ability to do this by recognizing that designing for a place and a person are reflections of each other. Crafting an element for a space also requires room for that element in the person – and conversely, a design for a person requires the support of a place. At the end of the day, if the place does not support the person – or the other way around – it is not a permanent (permaculture) solution. A permaculture design cannot exist apart from the rest of the world, and especially not from people. Not only does the physical world require constant exchange of materials and energy, but our mental and social selves need that exchange too. Our permaculture designs are supported by systems and structures not only within our human selves, but also in the outside world, and we need to be aware of and connect to those elements. Perhaps striving for the perfect self-contained permaculture design is the opposite of what we need to do; it can only create a bubble that will ultimately stagnate and become irrelevant. People are a major agent for change, and the more connections we make to and through them creates more possibility for change. Therefore, people are the most important asset to any design. When we create as many connections within and outside our design as possible, we can become truly sustainable and create real change in the world. In addition to holons and quadrants, integral theory brings another useful concept to permaculture: states. Simply defined, a state is a mode or condition of being; its nature can be either baseline or altered. In order to bring the concept of states into permaculture, we have reframed the scale of permanence as the baseline state for a system, and expanded it as a model to include altered states. We need to know when a system enters into a chaotic state or how we can induce one, as this creates abundant opportunity to “Creatively use and respond to change.” And finally, while permaculture already makes us aware of states in the physical landscape, we also need to become aware of states in the mental/emotional and social realms. 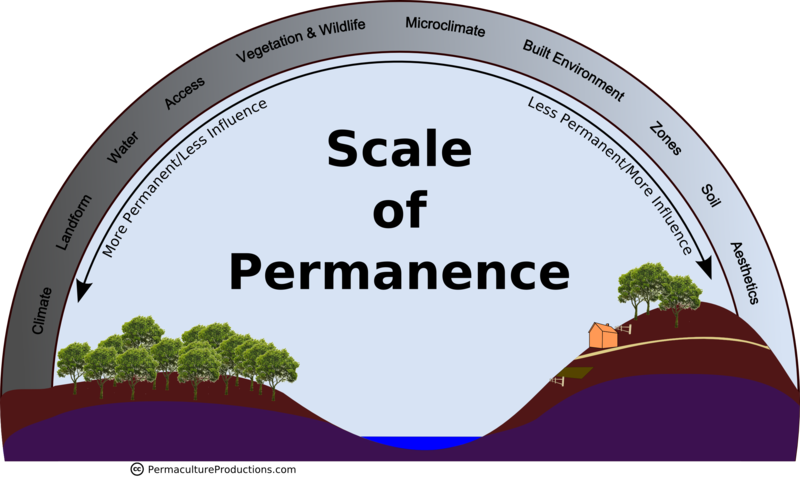 A standard tool used in permaculture design is the scale of permanence. This scale of permanence, essentially a tool for mapping the physical world, helps us to organize the elements of our design in order of our ability to influence them, from least to most. Climate is the least influenceable and most permanent, then landform, water, access, vegetation & wildlife, microclimate, the built environment, zones, soil and aesthetics, each being more and more malleable in our designs. This scale gives our design a template so that we don’t design ourselves into a corner. A rather simplistic example would be putting vegetation ahead of climate: if you decide you want to plant mangos in the North American midwest, you will quickly find that come winter that was not an appropriate plant choice. Designing in the order of the scale of permanence would prevent you from making such a mistake. Since all of the aspects on the scale of permanence will change through time, what this tool can help us do is take a snapshot of the current conditions: in other words, to outline the current state of climate, landform, et cetera. The sum of all of these states makes up the baseline state of our design, which is the condition or conditions that the system will naturally tend toward. Knowing this baseline state is useful because it will be the basis for all of our future design decisions, which depend on how much energy we will need to use to make changes we want to see in the design. It also will help us to recognize when that baseline, once it has been established, has changed. The baseline state is not actually a constant, permanent condition, but in fact the average of many different states through time. 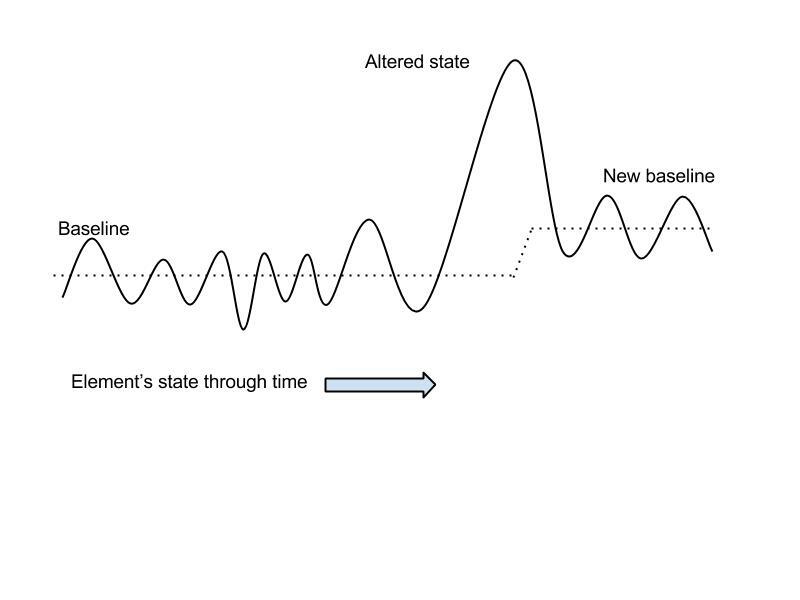 When a condition deviates far enough from the baseline state it can be considered an altered state, or even a peak state if it is at a theoretical maximum or minimum. These are events that may occur regularly or seemingly randomly and can cause a change in the baseline state, bringing the system to a new baseline as the altered state moves through the system. An example would be when a river floods, leaving the river’s path, banks and floodplain permanently changed. The amount of swing between between the baseline and the altered state will inform the degree of change between the original and the new baseline. Sometimes altered states have cyclical rhythms, the cycles themselves becoming baselines. For example, the annual changes of seasons, phases of the moon, and regular patterns of monsoon and drought are all altered states that are effectively a baseline because of their regularly recurring nature. Even climate change is cyclical on a geologic scale – though it has also been influenced by one-off events, such as a volcanic eruption that spews sunlight-blocking ash into the atmosphere, or tapping into global carbon reserves to power a civilization. How do altered states fit in with the scale of permanence and permaculture? We need to expand the scale of permanence to include an awareness of potential altered states that could happen within and outside of our design. Knowing the potential for altered states can help the designer organize and size the particular elements of their design so that they don’t become overwhelmed and fail in an altered/peak state situation, possibly even to the point of absorbing or deflecting the impacts of that altered state entirely. For example, a flood (an altered state of water) might wash out individual roads, swales, plants, and even wash away soil. All of these elements could be designed to work together so that they slow down and harvest the water, ultimately changing the nature of a flood from that of an event which completely alters the baseline and depletes the system, to one which recharges the system with water. In this example, climate is the root cause of the flood, but the overall effect on the design is determined by other elements on the scale of permanence. Of course, we will never be able to design for every altered state that may come to pass, and that’s where the chaotic state comes into play. When our planning and preparation abilities are not enough, an altered state sends our whole design into a chaotic state. This is the point where one or more elements of the system becomes so altered that it throws the whole system into disorganization. Chaotic states are moments of great possibility that we can make creative use of if we are prepared to. Chaotic states can also be introduced to force a change in other elements of a system. Whether introduced or naturally occurring, the chaotic state can be a useful tool that allows us to more easily reorganize a system, but they can be even more destructive if they persist for too long. Keen awareness about the existence of a chaotic state and when it has reached the limits of its usefulness is essential. As we have demonstrated above, in permaculture there is already an awareness of physical states that are relevant to a design, such as the natural change of seasons, weather and climate, and succession. These exist in an obvious way and are relatively known and tangible phenomena. Equally important to our designs are the states of the designer, other actors in the design and the social landscape that interacts with a particular site. People themselves have different physical and internal states: childhood, adolescence, adulthood and elderhood, emotions and moods, and sets of knowledge, experience, and cultural conditioning. Some social states might include local zoning and other laws, the local acceptance of a “messy” yard, and states of economic expansion or contraction. They even can have chaotic states, which may range from the death of a spouse or parent and loss of a job in the personal realm, to revolution, pandemic, or the loss of a local industry in the social realm. All of these states influence our human systems and should be appraised and accounted for in our designs. To that end, the tools that we use to organize and document states in the physical/external landscape can also help us identify states in the social and internal realms. The scale of permanence – with a bit of imagination – helps us establish baselines in other quadrants. What is the social climate that we live in? What is your mental climate and ability to deal with change? What is the climate of the institutions that exist around you? Another issue we may encounter is how to know when a baseline we’ve established reflects reality or is rather a projection of our personal perception of reality, which can be influenced by personal bias, cultural conditioning, or even misinformation. This is where the integral model really comes into play. Possible states can only be determined by our observations and available evidence, but the information available to two different individuals and can still be radically different, causing each person to interpret the state differently. This is why we need to gather many different perspectives as we craft our designs and leave room for the possibility of new ones that we may not have considered. The point of observing and documenting our baseline, altered, and chaotic states, in the natural, social and individual realms is to both be able to plan for them and know when and how to intervene, if possible. How a design interacts with the rest of the world is just as important as how the design functions within itself; therefore bringing our attention to different states within and outside of our design in all the quadrants can truly help us achieve permanence.